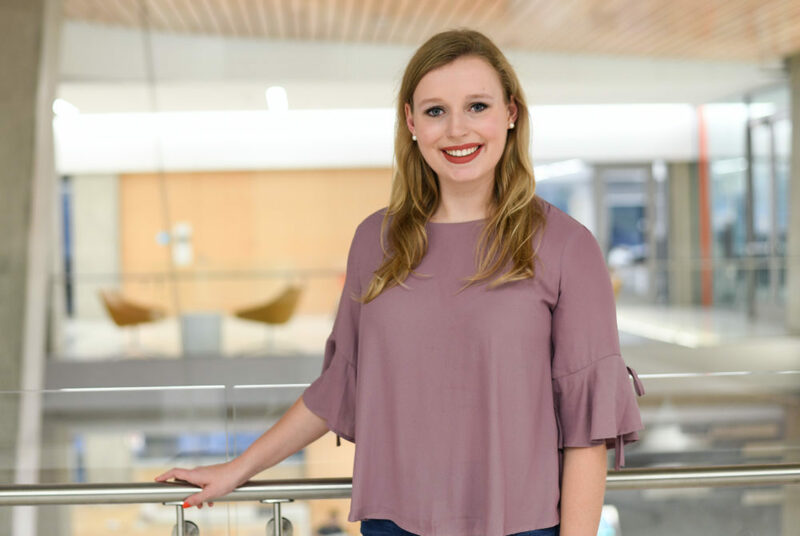 Maggie Steiner, the editor-in-chief of the GW Undergraduate Review, started GW’s first-ever undergraduate research journal with two other students. Updated: Feb. 12, 2018 at 1:04 p.m. The research office is funding GW’s first-ever undergraduate research journal as part of its goal to entice more undergraduates to get involved in projects. A student organization will receive about $10,000 this academic year from the Office of the Vice President for Research to publish “The GW Undergraduate Review,” which is slated to start publishing by the end of the semester. Students who started the journal said it will give undergraduates the opportunity to showcase their projects in preparation for graduate school and careers in academia. Leo Chalupa, the vice president for research, said when the team of three students originally approached him about the idea in December, he had already been mulling over the idea of a research journal at GW. He said OVPR would not be involved in creating the journal, but wanted to support the student-run effort. Performing research moves students’ educations forward for undergraduates of all majors because it offers tangible on-the-job experience, he said. “The whole idea is that you get a chance to see what research is really like,” he said in an interview last week. Chalupa said the journal, which will be published once a year, will be entirely student-led, and include undergraduate research from all fields ranging from engineering to literature. In the fall, Chalupa said OVPR wanted to make growing undergraduate research one of its top priorities this academic year, with a specific focus on expanding opportunities for undergraduates to work with faculty on projects. Chalupa said he also launched the research office’s first-ever $500 essay contest to challenge undergraduates to write about their research experiences. He said the prize-winning essays can appear in GW’s research magazine. The journal is open to all undergraduates, who can apply by Feb. 28 to be included in the first issue. After submitting a proposal, a group of student editors review and edit the submissions with the help of faculty advisers. Maggie Steiner, the editor-in-chief of the journal, started the initiative last year with two other students, Aleksandra Dagunts and Delaney Foster, who were both in the Women’s Leadership Program. She said the students – all science majors – wondered why GW didn’t already have an undergraduate research publication because schools like Stanford University and Texas A&M University already publish undergraduate projects. She said the group hopes to not only get students involved in projects at the undergraduate level, but give opportunities to those researchers that have never previously had the chance to be published. “It’s a really great way for students to get involved with hands-on research and get to know what the actual field of academia is like as an undergraduate,” Steiner said. Foster, a sophomore and the director of outreach for the journal, said faculty have been supportive of the idea, with many saying it was a resource they’ve wanted GW to have for a long time. Foster said the group has come a long way from the $200 it received from the Student Association when it first registered as a student organization last year, but members are still trying to raise the group’s profile on campus. The journal has received four submissions so far, but leaders of the group are hoping that once the first issue is published, more students will want to get involved next year. “Most people don’t know there’s a research journal at GW,” she said. Dagunts, a biology major, said many students aren’t aware of the array of research opportunities available on campus, especially in the Science and Engineering Hall. The Hatchet incorrectly spelled Aleksandra Dagunts’ name on one reference. It is now correct. We regret this error.